Darjeeling : The army was called in on Thursday after thousands of angry Gorkha Janmukti Morcha (GJM) activists demanding a separate Gorkhaland state indulged in arson and pelted stones at police, injuring 15, as around 45,000 tourists were stranded in the northern West Bengal hills due to the violence. "Requisition from state government received. Two army columns based in Darjeeling moving out," said Wing Commander S.S. Birdi, Chief Public Relations Officer of Defence, at Kolkata. One column comprises 43 personnel. On a day Chief Minister Mamata Banerjee held her cabinet meeting in Darjeeling - the first time in 45 years that the state cabinet had met in the hill district - the GJM workers went on rampage demanding a separate state of Gorkhaland. They staged demonstrations, raised slogans against Banerjee and engaged in a pitched battle with the police, as panicked tourists tried to rush out. 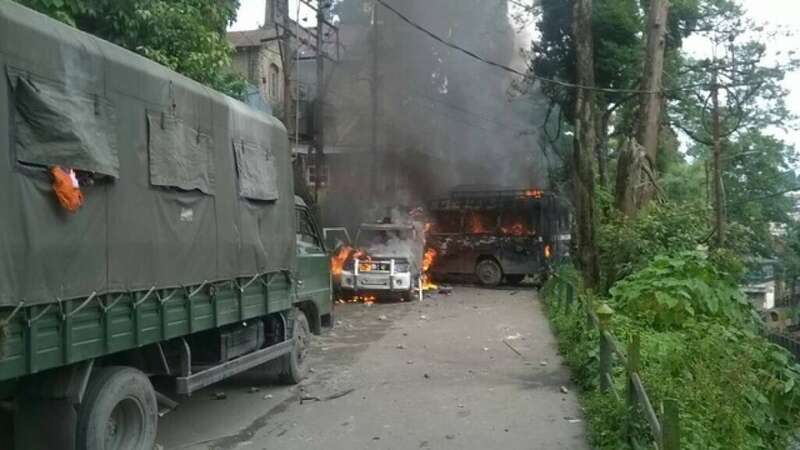 The GJM supporters broke through police barricades, damaging and torching five police vehicles, set fire to a traffic outpost and a state bus, and indulged in massive stone pelting at the police. The police, who initially beat a hasty retreat, made repeated baton charge and lobbed tear gas shells at the mob to quell the violence that erupted near Bhanu Bhawan on the tourist hub Mall Road, that was virtually taken over by the GJM workers. At least 15 police officers, including Jalpaiguri range Deputy Inspector General of Police Rajesh Kumar Yadav, sustained severe injuries, as shops and hotels downed shutters in fear. The Morcha supporters also forced the markets in the neighbouring Kalimpong district to shut down. Banerjee, after her cabinet meeting, claimed the Morcha's agitation was based on a "non-issue". "Every political party has a right to protest. So have they. But what is the issue on which this agitation is based? There are no issues at all. The Morcha is trying to gain political relevance by holding these protests," Banerjee observed at the end of her Cabinet meeting. Banerjee and two other ministers have stayed back in Darjeeling after the cabinet meeting in view of the volatile situation and the plight of the tourists. "We have no enmity with anyone. We want the hills and the entire state to be well," she added. The GJM claimed that 45 of its supporters were injured in the police action. "Our party has called for a 12-hour shutdown in the North Bengal hills, including Darjeeling and Kalimpong districts and the Mirik subdivision, in protest against the indiscriminate police action on our peaceful demonstration," GJM General Secretary Roshan Giri told IANS. "We condemn the police action on our supporters today in Darjeeling. At least 45 GJM supporters including women got injured in the police beating," he said. State Tourism Minister Gautam Deb said around 15,000 tourists were stranded in Darjeeling town, and around 30,000 in the other parts of the hills. Holding the Banerjee government responsible for the violence, the opposition Left Front urged the Chief Minister to take immediate steps to restore peace in the region. "The situation in the hills is a matter of grave concern. The Chief Minister's policy on the north Bengal hills is similar to the Prime Minister's policy on Kashmir. There should be discussions on peace, not provocation," said LF major Communist Party of India-Marxist state Secretary Surjya Kanta Mishra. State BJP president Dilip Ghosh blamed Banerjee for "stoking the fire" in the hills with her repeated visits there. "Now she is trapped there, and seeking army help to return home," he said. The political temperature soared in North Bengal hills after the GJM -- the dominant party in the region for close to a decade -- seized on Banerjee's earlier announcement that Bengali would be a compulsory subject in schools across the state. The GJM, looking for a confrontation with the ruling Trinamool Congress which has in recent elections emerged as its main rival in the region, immediately hit the streets, dubbing the move as a bid to "impose Bengali in the hills" and revived the demand for Gorkhaland. Banerjee on Monday tried to cool passions by announcing that Bengali would not be compulsory in schools in the Darjeeling hills and in certain areas of the Dooars and the Terai.